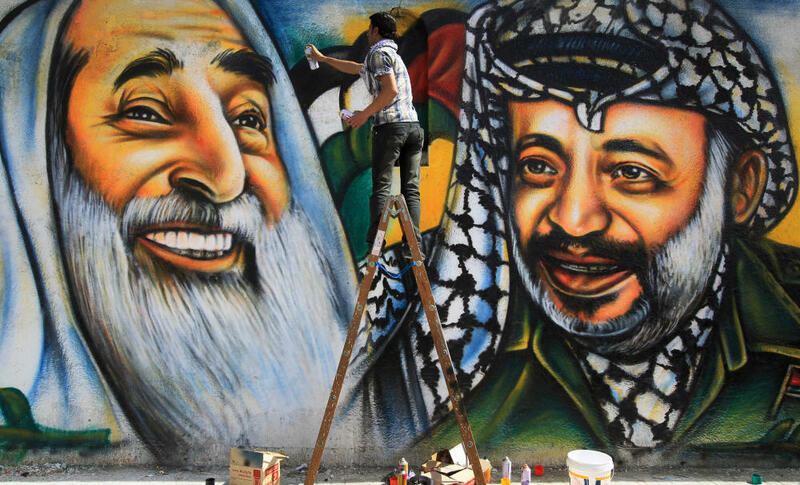 Palestinian artist Mohammed al-Dairi paints a mural of late Palestinian leader Yasser Arafat (right) and late Hamas leader Sheikh Ahmed Yassin (left), in Gaza City. Hamas leaders are divided on what direction to take the Islamist movement, with some calling for reconciliation with Arafat's Fatah movement. The Islamist movement Hamas, which rules Gaza, is a house divided. Its leaders say there are divisions among the ranks as they try to grapple with where to push the movement: toward moderation or a continued commitment to armed resistance against Israel. Omar Shaban, a Gaza-based political analyst, wonders where Hamas is headed in the next two to three years. He says the changes in the region after the Arab Spring not only shook the world, but they also forced groups like Hamas to reassess where they stand, in terms of old alliances and future direction. "Hamas is living in the Middle East; they don't live in a vacuum," Shaban says. "Hamas has to cope with or respond to these new challenges. This has created a lot of debate within [the] Hamas movement itself." Hamas is filled with contradictions. On the one hand, it is a Sunni Muslim group that was supported by Shiite Iran; until recently it had its base in Alawite-controlled Syria. It is viewed as a terrorist organization by the West and Israel, responsible for suicide bombings and rocket attacks. But it is also a government, administrating the lives of 1.6 million Palestinians in the Gaza Strip. If you were to visit Hamas leader Ahmed Yousef in Gaza, you'll hear of a Hamas that is now willing to turn away from armed resistance. "Because of the situation now because of the Arab revolution ... we shouldn't give the Israelis any excuse to continue their incursion or aggression against us," Yousef says. "That's why we resort to this nonviolent approach or the popular peaceful resistance; we hope the world community will respond positively to what we are doing." But go to see Mahmoud Zahar, one of Hamas' founders, and the message is very different. "Hamas is still committed to its principles as a liberating movement [and] freedom fighters," Zahar says. These fault lines also extend to where Hamas will get its support. Last month in Cairo, the group publicly broke with its erstwhile benefactor Syria, saying it supported the right of the people there to get rid of the Assad regime. That angered Iran, one of Syria's biggest backers, and up until recently the country that provided the most money to Hamas. But after the revolutions in the Middle East, Hamas is not looking to Tehran anymore but to Egypt and the Muslim Brotherhood. Hamas was founded as an offshoot of the brotherhood, and its leaders are looking to strengthen that relationship. Hamas now says it won't intervene in any conflict between Iran and Israel over Tehran's suspected nuclear weapons program. The man leading the charge toward change is Khaled Meshaal, Hamas' long-exiled political leader. He's been pushing reconciliation with the rival Fatah movement, which holds sway in the West Bank. Yousef, the Hamas leader, sees Meshaal as a positive force in Hamas. "I think what Khaled Meshaal has done is something great and he should be respected for that," he says. But Zahar, the group's founder, is unhappy at many of Meshaal's recent decisions and says he is happy the political leader is stepping down. "He spent more than 17 years as chairman of Hamas movement," Zahar says. "I think it is good for him to leave now." Whatever the divisions, though, most Hamas members agree the Arab Spring has been good for the movement. Political Islam is on the rise throughout the region and Hamas leaders have traveled extensively. Analyst Talal Okal in Gaza predicts the closer Hamas gets to the Egyptian Muslim Brotherhood, the more moderate it will become. "The Muslim Brotherhood in Egypt has moderate politics ... so [what] they want from Hamas [is] to moderate its political program to have reconciliation," Okal says. "They are not encouraging violence against Israel." But Okal warns the upheaval in the region is far from over, and Hamas is still deciding its future direction. It's MORNING EDITION from NPR News. I'm Steve Inskeep. The Gaza Strip is calm today, after a long weekend of attacks and counterattacks between Gaza and Israel. Gaza sent into Israel, scores of rockets. Israel responded with air strikes that left 25 Palestinians dead. Egypt brokered a ceasefire, now in place. The Islamist movement Hamas, which runs Gaza, was not behind the latest hostilities. And, as NPR's Lourdes Garcia-Navarro reports from Gaza, the movement says it's changing. LOURDES GARCIA-NAVARRO, BYLINE: Hamas, right now, is a house divided. OMAR SHABAN: Where will be Hamas heading in the coming two to three years? GARCIA-NAVARRO: Omar Shaban is a Gaza based political analyst. He says the changes in the region after the Arab Spring not only shook the world, they also forced groups like Hamas to reassess where they stand, in terms of old alliances and future direction. SHABAN: Hamas is living in the Middle East. They don't live in a vacuum. Hamas need to cope with or to respond to these new challenges. This has created a lot of debate within Hamas movement itself. GARCIA-NAVARRO: Debate and disagreements. Hamas is an organization filled with contradictions. On the one hand, it's a Sunni Muslim group which was supported by Shiite Iran and, until recently, it had its base in Alawite-controlled Syria. It's viewed as a terrorist organization by the West and Israel, responsible for suicide bombings and rocket attacks. But it's also a government, administrating the lives of 1.6 million Palestinians in the Gaza strip. Visit Hamas leader Ahmed Yousef in Gaza and you'll hear of a Hamas which is willing, now, to turn away from armed resistance. AHMED YOUSEF: Because of the situation now, because of the Arab revolution, the Arab Spring, we shouldn't actually give the Israelis any excuse to continue their incursion or aggression against us. So that's why we resort to this non violent approach or what they call they popular peaceful resistance. So we hope that the world community will respond positively to what we are doing. GARCIA-NAVARRO: But go to see Mahmoud Zahar, one of the founders of Hamas, and the message is very different. MAHMOUD ZAHAR: Hamas is still committed to its principal as a liberating movement, freedom fighters. GARCIA-NAVARRO: Those fault lines also extend to where Hamas will get its support. Last month in Cairo, the group publicly broke with its erstwhile benefactor Syria, saying it supported the right of the people there to get rid of the Assad regime. That angered Iran, one of Syria's biggest backers, and up until recently, the country that provided the most money to Hamas. But after the revolutions in the Middle East, Hamas is not looking to Tehran anymore, but to Egypt and the Muslim Brotherhood. Hamas was founded as an offshoot of the brotherhood and its leaders are looking to strengthen that relationship. Hamas now says it won't intervene in any conflict between Iran and Israel over Tehran's suspect nuclear program. The man leading the charge towards change is Khaled Mashal, the long exiled political leader of Hamas. He's been pushing reconciliation with the rival Fatah movement which holds sway in the West Bank. Ahmed Yousef sees Mashal as a positive force for Hamas. YOUSEF: I think what Khaled Mashal has done is something great and he should be respected for that. GARCIA-NAVARRO: But Mahmoud Zahar says he's happy Mashal has announced he's stepping down. He's unhappy with many of the recent decisions Mashal has taken. ZAHAR: Now he's spent more than 17 years as the chairman of Hamas movement of outside. I think it is good for him to leave now. GARCIA-NAVARRO: Whatever the divisions, though, most Hamas members agree that the Arab Spring has been good for the movement. Political Islam is on the rise throughout the region and Hamas leaders have been traveling extensively. Analyst Talal Okal, in Gaza, predicts the closer Hamas gets to the Egyptian Muslim Brotherhood, the more moderate it will become. TALAL OKAL: The Muslim Brothers in Egypt have a moderate politics. They are in the responsibility now, so they want from Hamas to moderate its political program, to have reconciliation. They are not encouraging any violence against Israel. GARCIA-NAVARRO: But Okal warns the upheaval in the region is far from over. And Hamas is still deciding, in what direction, it will head. Lourdes Garcia-Navarro, NPR News. NPR NEWS Transcript provided by NPR, Copyright NPR.